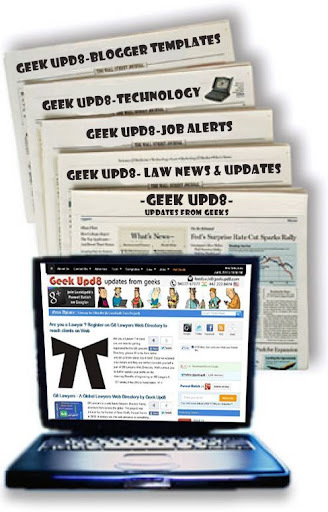 GeekUpd8 is the preferred journal with technology, templates, law and job alerts, keeping thousands of technology enthusiasts, bloggers, designers, lawyers and youth readers updated, thus making it an ideal place for you to showcase the best of your products, services and much more under a common network hood. We provide advertisement proposals at reasonable prices, and at times free* as well. We have various Ad slots that you can consider for showcasing your product. First of all 728 x 90 banner size on top right; than 300 x 250 medium rectangle in the sidebar; a 468 x 60 banner right below the title of the article; besides these we've 125 x 125 ad slots in the sidebar. You can ask us, which ad slot can work best for you, we would love to advice you to help your product/service grow faster. If you've a desire to promote your product/services or anything else with us, just drop in your proposal below. Alternatively, you can also send an email to our editorial staff at editor[at]geekupd8[dot]com. We'll respond to your proposal with a few hours. [ * ] - We provide free advertising as said above in case you have client history with us, that is in case you have advertised earlier with us. Further if your product seems to be very useful for masses, we can accept your proposal without charging anything for the ad space. Get the latest judgments, legal updates, tech and job alerts in your Inbox for free right now. Enter your email address to subscribe right now. Geek Upd8 - Updates from Geeks © 2016. All Rights Reserved.